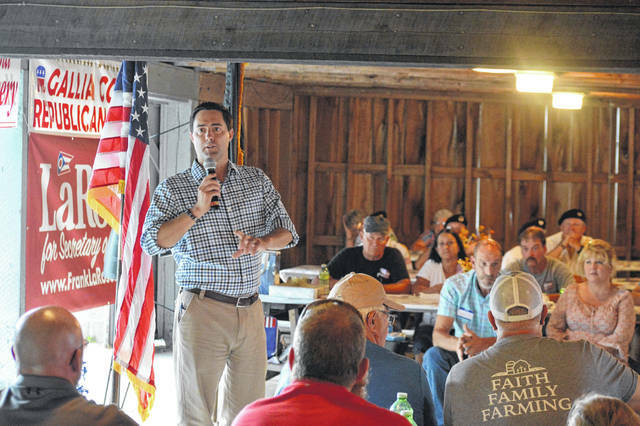 District 27 Ohio State Senator and Ohio Secretary of State candidate Frank LaRose (R-Hudson) served a Gallia GOP Corn Roast keynote speaker along with Speaker of the House and local State Representative Ryan Smith (R-Bidwell). RIO GRANDE — Gallia Republicans gathered for their annual Corn Roast in the Bob Evans Shelter House Thursday evening to discuss hopes for the future and visit with local and state candidates. Among the featured speakers were District 27 Ohio State Senator and Ohio Secretary of State candidate Frank LaRose (R-Hudson) and Ohio Speaker of the House and State Representative Ryan Smith (R-Bidwell) for his first home public speaking appearance since being named Speaker. Gallia Auditor Larry Betz announced this would be his last term as auditor, should he be elected, and thanked voters for their past and continued support. Gallia Commissioner Harold Montgomery said it was a tough year for the Gallia Commissioners and the county’s general fund, losing nearly a tenth of its revenue over rising crime costs and state pay cuts. Montgomery said he looked forward to a future working with new state officials and hoped they would remember the trials of local government, Gallia County and southeast Ohio. Montgomery also lauded efforts made by Gallia Engineer Brett Boothe as he lobbies in Washington DC for a smart highway project in Gallia. He also praised efforts by Gallia Economic Development Director Melissa Clark for recent efforts speaking with businesses in Atlanta, Georgia, which could yield a few hundred jobs in Gallia as projects develop. Craig Baldwin, candidate for Ohio Supreme Court, made a few brief words as well as Mike Hess, candidate for Ohio’s Fourth District Court of Appeals, Jason Smith, candidate for Fourth District Court of Appeals and Ohio State Senator for District for the District 17 Bob Peterson also shared some words of encouragement with fellow Republicans. Smith said the House had passed 93 pieces of legislation since he was named Speaker “and got right back to work” after a period of challenges before being named Speaker. Smith said one of his focuses was to bring broadband to areas that need it and he was working on legislation amounting to around $100 million to soon invest in such efforts along with utilizing $2 million in federal support for a mapping program to identify census blocks that need the $100 million investment for broadband infrastructure. Smith would introduce LaRose. The senator chairs the Commerce and Workforce Committee along with the Senate Transportation Committee. He was also previously chair of the Public Safety, Local Government and Veterans Affairs Committee as well as the State and Local Government Committee. LaRose encouraged conservative supporters to go out and vote, as every vote was important. The senator felt, according to what he was hearing, left leaning media was thinking conservative voters would not make the turnouts left leaning voters might this fall. “We know there’s no such thing as an off election,” said LaRose. LaRose said when he served overseas in the Middle East, he noted new voters often had purple thumbs they would display with pride, signifying they had voted in an election. Terrorist regimes would threaten to remove those limbs, according to the state senator. He felt those voters were risking their lives for their democracy and he stressed the importance of protecting that right as a candidate for Ohio Secretary of State. While encouraging Gallia Republicans and visitors to vote for conservative candidates, he said he was willing to discuss bipartisanship during an interview after his public address.